Women should be breast feeding their babies for the first six months without adding any solid foods or formula, say the experts, including the World Health Organization and the Canadian Pediatric Society. Best for preventing infant allergies, toddler allergies, asthma and getting healthy kids with a high IQ. The latest guidelines replace previous advice that moms could add solid foods or formula to their babies' diet along with breastfeeding at four to six months. Just Breastfeeding for Baby for the first 6 Months? The longer you breastfeed, the less chance your child has of developing food allergies as well as allergic diseases such as eczema and asthma. Breast milk is rich in an immunoglobulin called secretory IGA, which acts as a protective paint, coating the intestines and keeping food allergens out of the bloodstream. Why? Breast milk contains antibodies that help babies fight off illness. Exclusive breastfeeding for six months increases the protection against infections that can cause diarrhea. Why a Higher IQ and Healthy Kids? A higher IQ of at least 6.8 points has been related to breast feeding, regardless of the socio economic status, the IQ or the mother and other factors such as birth weight. Only 10% of breast fed children do not have a higher IQ because they lack a gene that is needed for this effect, according to Dr. Terrie Moffitt, a professor of brain sciences in London, England. Adults who were breast fed had lower BMI (body mass index) on average, and had higher HDL (good) cholesterol than their bottle-fed counterparts. Having a higher HDL and lower BMI is considered to protect against cardiovascular disease such as stroke and heart attack. So, maybe it is worth some "inconvenience" to get your baby off to a good start with no infant allergies or no toddler allergies! Breast feeding also has a bonus for YOU because it protects the mother against future breast cancer. Studies have shown that breast milk alone in an infant's first half-year of life confers increased health benefits for a longer period, said Dr. Margaret Boland, chair of the Canadian Pediatric Society's nutrition committee. "Breast feeding means not having mothers give babies infant cereal at four months, extending the period where the baby's sole source of nutrition is breast milk," says Dr. Boland. "This excludes formulas and all solids -- cereals, fruits, vegetables, meats, any of the usual infant foods." "When you introduce other food into the diet, you change some of the absorption of nutrients that babies get from their food," she explains, saying that cereals are not sterile and may introduce micro-organisms into the infant's system. The Canadian Pediatric Society now says that along with introducing babies to solid foods no earlier than six months, breast feeding can continue for up to two years and beyond. Doctors are struggling to get women to extend their duration of breastfeeding, according to Dr. Boland. Don't be among the less than 20% of mothers who are now breast feeding for 6 months! Women tend to be bombarded with the commercialization of everything, which says if you're a modern mom, you need to be on the go and use a bottle for your baby. Hopefully you will be able to resist pressure from grandparents and friends to give your baby "baby food" too early! Why Delay Solids against Allergies? Really? Breast feed for 6 months against allergies? Because mature intestines are better able to screen out potential allergens and keep them from entering the bloodstream. Even if breast feeding and you feed your infant solid foods (especially those containing protein, such as wheat, soy, and dairy) before the intestinal lining is mature, food allergens can seep into the bloodstream, causing baby to build up antibodies to those allergens and later become allergic to those foods. When you do start solids, introduce the least allergic (lowest protein) foods first, such as fruits, vegetables, and rice. Make citrus fruits the last fruits you introduce. In the past, experts suggested waiting until at least eighteen months before introducing potentially allergic foods, such as egg whites, tomatoes, shellfish e.g. shrimp, and peanut butter. Most said to delay introducing cow's milk products until at least a year of age. But the new science for preventing allergies suggests introducing baby solid foods to baby all at once, and not holding back these foods. By twelve months of age, your child's intestines are mature enough to screen out most of the food allergens, to prevent food allergies. The intestines are the body's filtering system, screening out potentially harmful substances and letting in healthy nutrients. In the early months, this filtering system is immature. As a result, allergens can enter the blood stream, causing the immune system to produce antibodies to that food, thereby creating a food allergy. Breastfeeding is still best between four and seven months when a baby's intestinal lining goes through a developmental growth spurt called "closure," meaning the intestinal lining becomes more selective about what to let through. By six to seven months of age your baby is able to filter out more of the offending allergens to prevent allergies. You will want to carefully watch if there is a family history of food allergies, and carefully introduce foods to which other family members are allergic. Need Help with Breast Feeding Problems? During pregnancy there is usually very little focus on breast feeding. We expect it to be natural, which it is, but it is not necessarily easy. Many babies don’t “latch” easily or at all, and it is often a learning process for all. How do you know you have enough milk? Breast fed babies may even be smaller and may not fit your doctor’s “normal” growth curve, but they are healthier and stronger. If you have problems, don’t give up! Get a lactation consultant to help! Find out from the LA LECHE LEAGUE for nursing mothers if there is a local leader or a support group, or get one of the following books by the experts or by mothers who have gone through it all. Children who were breastfed as babies had higher scores on tests of VOCABULARY and REASONING at age FIVE, than those who were NOT breast fed. A British study found that breastfeeding seemed to make the biggest difference for babies who were born early and therefore had more catching up to do in their BRAIN DEVELOPMENT. "there are essential fatty acids in breast milk which are good for cell development and brain development in particular." Or, "there could be differences in hormones and growth factors which are lacking in formula." The study accounted for differences in moms education and income. Which legal and illegal drugs affect your baby when nursing? Both prescription drugs and street drugs will affect your baby while breast feeding! Be aware of anything you are taking that might harm your baby. These can be both legal and illegal. FIND OUT MORE HERE about the effects various drugs have on lactation and breastfeeding! We hope that you will be able to treat yourself and your baby to 6 months of special nourishing and bonding! Breast feeding benefits for baby's brain, IQ and helps avoid toddler allergies -- and a baby eczema food allergy and even against a peanut oil allergy. 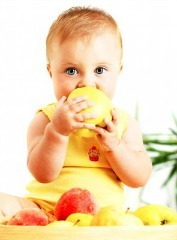 What about introducing solid foods to baby? A life without eczema, asthma, infant allergies, toddler allergies or a peanut butter allergy is certainly worth the effort!